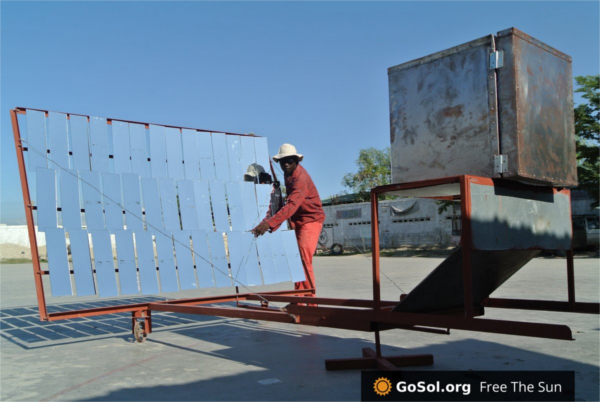 GoSol: solar can also cook, bake and steam! Solar electricity is an unstoppable force all over the world. Both in large scale solar farms and for the home-owner. But the energy from the sun can be used in many more creative ways. From drying your clothers, or drying fruit, to cooking a stew, baking bread, or even creating charcoal. How far will solar go in 2015? 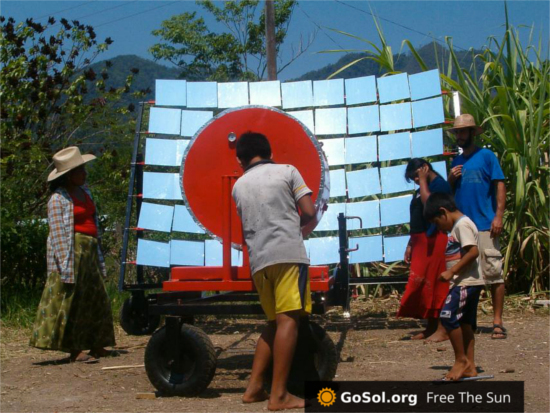 Solar energy doesn’t only come in the form of solar panels. 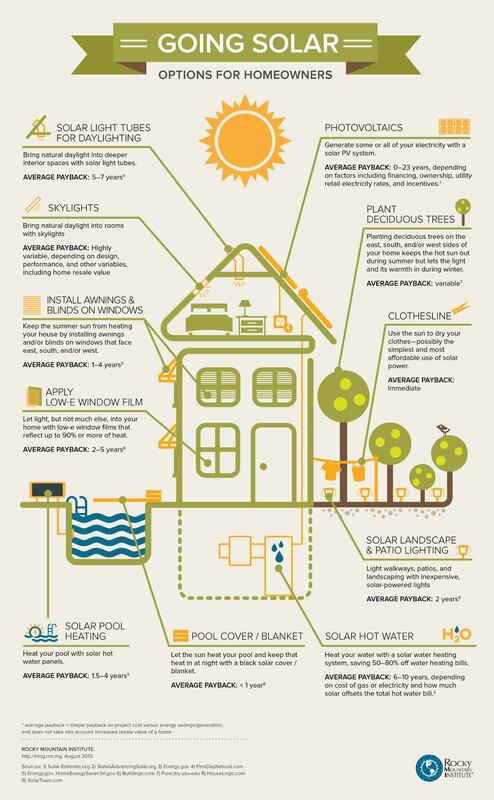 From shading to skylights or drying clothes, there are a multiple of applications that take advantage of solar energy. Below is a great info-graphic by the rocky mountain institute. Starting a new company is hard. No doubt about it. Innovating and developing new technology is hard too, but it’s something we are passionate and good at. The two co-founders have created innovations in wind technology, data analysis, web development, and engineering. However, as a start-up, the most critical part is making sure that this innovation is useful and needed. And this can only be achieved leaving the comfort of the office and the computer. Last year, we travelled to Aberdeen to meet numerous players in the renewable energy industry and validate our ideas and business model. The press team was interested in our startup and interviewed the co-founders. Best solar panel direction – Can West beat South? When initially planning a solar panel installation for your house, your first thought might be: “is my roof right for solar panels?”. Like most people, you probably consider south-facing solar panels to be the best for generating energy. In fact, if you are living in the northern hemisphere (e.g. the US), you will generate the most electricity out of your solar panels when facing south because the sun is shining from the south. But, can you imagine why it might be reasonable to place your panels on a west-facing roof? 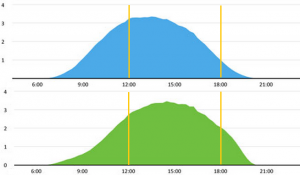 Just remember one of the many factors that determine whether solar makes sense: Your peak demand time. Not to keep you in suspense, our consideration for placing solar panels to the west is based on the assumption that the largest savings occur if you produce the most energy when you need it – and this might be in the evening, when sun shines stronger from the west! These considerations received attention over the past weeks and were also misunderstood in some cases. Surely, west-facing panels don’t produce more energy than those facing south. But, because the energy produced can’t be saved and residential panels are generally in a fixed position, west facing panels may be worth considering. A study by Pecan Street revealed an increase using west-facing panels during peak demand hours by 49%, which resulted in a 65% peak reduction. The chart shows how energy generation varies in regard to the azimuth (or orientation of the roof) and time of the day. While south-facing panels produce less and less electricity in the evening, west-facing ones absorb more solar energy from afternoon till evening. Some utilities will charge more for electricity during the day than during the night (also called dynamic pricing). Pecan Streets concludes that west-facing panels might make even more sense for dynamic pricing models, making kWh-prices more expensive during peak demand hours and, hence, west-facing panels more profitable. To answer the original question of your roof’s is applicability for solar, you must account for more than its azimuth. Your electricity needs and prices, incentives, panel and installation costs, shading, and so on must also be considered. Therefore, we at renooble take as much data into consideration as possible to create a valuable report for you. If you haven’t tried it yet, just enter your address in our search engine and see all the energy saving solutions – not only solar – we can recommend. Pecan Street: Are Solar Panels Facing the Wrong Direction? You can clearly see a steady development, starting below 10% in the 70s and moving beyond 30% in the last 10 years. If technology continues to advance at the same rate we should reach the magic level of 50% in 2020. However, it’s not that simple. You have to take a closer look and distinguish between the technologies. Four main ones stand out: Thin film, crystalline Si cells, single-junction GsAs and multijunction cells. There are some more, e.g. organic cells, but the four above play the biggest role. Thin film panels were expected to become very cost-efficient and flexible. But this hasn’t quite happened yet, so the technology hasn’t spread very far. In thin film, the solar cells are embedded in two panes of glass. There is a huge variety of semiconductors that can be used, but often CdTe (Cadmium Telluride) and CIGS (Copper Indium Gallium Selenide). See our solar PV ABC to read more about it. CIGS has the highest efficiency within thin film (~20%) but it is also the most expensive. For this reason, CdTe is most frequently used. Crystalline Si cells Crystalline silicon cells are made either by slicing wafers from one single crystal ingot (monocrystalline) or by sawing bars of silicon into wafers (polycrystalline) [read more on Making electricity out of sand]. The cells are connected and laminated under glass, to make them weather resistant. Furthermore, they are enhanced with anti-reflective coatings to absorb most of the sunlight. The highest possible efficiency for single-junction Si cells is 33,7%, but the current record stands at 25%. Multijunction cells With these, you can improve efficiency theoretically up to 87%. However, light has to be concentrated to get the most of it. Using lenses or dishes, the sunlight falling onto a large surface gets concentrated to a smaller cell. Using this combination of technologies and materials one can increase the efficiency but price and complexity also grow dramatically. If you are interested in the details and want to see which technology enabled what record, you can find a more detailed chart from NREL, the National Renewable Energy Laboratory. So how was the recent 44,7% record achieved? The Fraunhofer institute used a four-junction cell to beat previous efficiencies that typically used three-junctions. The combination of cells enabled the absorption of different wavelengths ranging from ultraviolet through to infra-red light. Furthermore, they used concentrating technology, which made it way more efficient than conventional PV technology. The question of whether 50% efficiency can be achieved is probably just a matter of time. However, no matter what efficiency is reached, it won’t be used on your roof for a long while. The raw materials are too expensive, and there is no industrial process to develop them at scale. Buying a larger number of less-efficient panels usually works best for most home applications. Ultra efficient (and expensive) panels usually make sense when weight and space are very limited (like on a satellite). 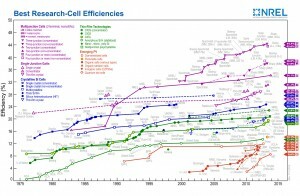 Also keep in mind that solar cell efficiency is not the same as solar panel efficiency. Your solar panel will reduce the cells’ efficiency due to losses in conductors, electrical contacts and imperfections. Still have questions? Fire away and our experts will get back to you soon! Here is a great explainer video from the Massachussets Government. Watch them explain residential solar panels from the point of view of homeowners, installers, DOER and MassCEC. 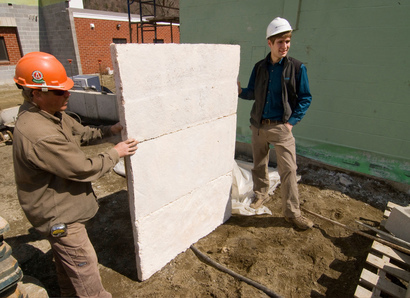 Can you make insulation from mushrooms? One question we often come across concerns the sustainability of different materials and technologies, be it solar panels or fiberglass insulation. The answer is that each material has it’s own advantages and disadvantages, so we should do our research before making a decision. In the following months we will review and evaluate different materials and technologies so it’s easier to decide. 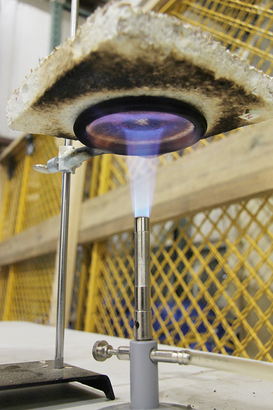 Material science is experiencing radical innovation, particularly when it comes to natural materials. 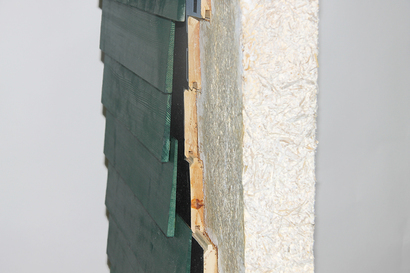 For example, Ecovative has started to use mushroom to grow packaging and insulation. What this means is that no oil is used as feedstock for the material and that once it’s time to discard it, you can just put it in a forest or a garden and it will enrich the soil and go back to nature’s cycle. Want to learn more? Watch the TED talk: Eben Bayer: Are mushrooms the new plastic? or read more about Ecovative Materials. The world’s largest solar boat is making London its final port of call on an epic voyage of scientific discovery along the Gulf stream. The MS Tûranor PlanetSolar has 512 square metres of photovoltaic cells made of up 809 solar panels or 29,124 solar cells. The eco-friendly boat is capable of crossing the Atlantic ocean in 22 days, smashing the previous Guinness World record of 26 days thanks to its clever design. 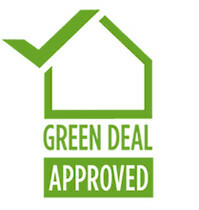 Green Deal – What is it? The Department of Energy and Climate Change has produced a short video explaining the “Green Deal” following their press release on the progress of the scheme. The green deal is essentially a way to finance the installation: Instead of paying up-front for your panels, insulation or heat pump the cost is payed every month as part of your utility bills. Toby on Can you make insulation from mushrooms?